Before you download the book Survive The End Days, read our tips on how to prepare for the end of the world. No one knows whether there actually will be a global catastrophe, however, be prepared for the worst. Create a reserve of food. The cost of living is increasing every year. Do your earnings catch up? No matter what your response is, start creating a stock of non-perishable foods. Rather than collect money into a money-box, it is better to create your own “foundation of survival”. Cereals and canned foods, salt, and pasta are easy to keep stashed away for a couple of years. Means of water purification. As you know, without food a person can go a few weeks, but without water, only a few days. Therefore, it should be put forth, by any means to get clean drinking water. There are many solutions: from portable or stationary filters to special pills. It is wise to have multiple ways of converting dirty water into drinkable water. Collect a library of books on crafts. If you are unaccustomed to buy and read books, relying on the Internet, it is worth thinking about what would happen if there is a disruption in the network or losing electricity. Therefore, we should start collecting books about useful crafts and skills, as well as on survival. You can print out texts from the Internet or collect books and video tutorials on your hard drive. Start saving up a barter fund. What will be necessary for the survival of everyone in the global crisis? Things that last a long time and do not spoil can be sold or exchanged for something you need. Stock up on soap, toothpaste, brushes, baking soda, medicines and alcohol, water filters, lighters, matches, tools, batteries, weapons and ammunition. All these items will be worth its weight in gold in the case of a global collapse. Instead of collecting money as the green paperbacks, it would be wiser to invest into necessary items. Get alternative sources of energy. A separate generator is a must for those who live in cold climates. It can be run on solar power or gasoline. When there is power outage it will be priceless. For stoves and fireplaces you also need to stock up on firewood and coal. Create an additional source of income. It does not matter whether you have a high-paying job, or you are unemployed, you need to start doing something for yourself. Start a small business (even if you have less time to devote to the main source of income) and lay the foundation for an additional source of income from it. Practice new skills. The ability to perform simple work and do something useful and beautiful by hand can help make ends meet and survive the global crisis of 2012. These skills can include: sewing, knitting, construction and repair, first aid and traditional medicine, cultivation of vegetables and fruits, food conservation, hunting and fishing. The fact is, that they will always remain necessary for survival. Take care of your health in advance. Psychological, mental, and physical health are all vital to your survival. Create a community of like-minded. Prepare for the worst together, because it’s much easier to survive with those who prepared as well. Unite as a group. Learn to find happiness in life’s simple pleasures: relationships with family, friends and pets, enjoy music and books. Appreciate what you have. 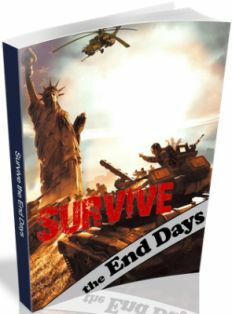 I highly recommend you download the book Survive The End Days through the link at the bottom of the page. I’m ready, are you?